Once you've given the basic Skill details like its name and description, now is the time to setup its steps. A step in Skill defines a certain task that would get executed at either in the begining when skill gets executed or in response to a certain trigger step. In the step tab, user will be setting up step properties under various sections like step properties and main section, where we can set step fields and their respective questions. We'll choose 'User' option as we're heading forward defining a user created custom step where we'll be defining step and field properties and more. What are the three types of Step (User, Internet Channel & Skill)? A User step is a custom step where user defines all the properties for it. Like various informations for a step e.g Step name, description, reciepents, welcome message and more. By default, a 'Main Section' is included as you select the 'User Step' option. You'll get to know about this in upcoming topics, where this is to give you a brief idea as to where we're heading. After you click 'Next' you'd notice that the step gets created, which could be noticed by its inclusion in the right sidebar with a name as you have given. In our case, it's 'User Info'. 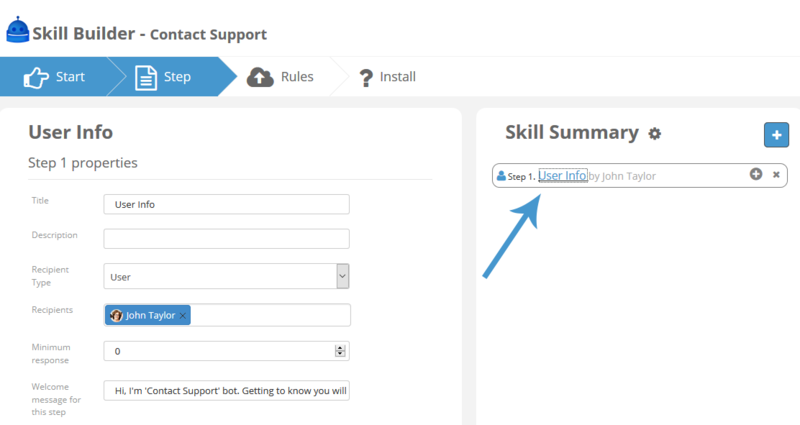 On the next help page, we'll see how you can set fields, questions and more for a specific step.